Not too long ago, budget gaming laptops felt inexpensive in the worst of ways, with terrible TN screens and shoddy plastic bodies. However, these days they’re a huge step forward, with excellent built quality to match their impressive gaming performance, all while maintaining a reasonable price. The Asus ROG Strix Hero II, announced at Computex 2018, furthers this trend with a nearly bezel-less display and enough RGB lighting to make your friends jealous. Best of all, every Asus ROG Strix Hero II is well equipped with the latest Intel Coffee Lake processors and up to Nvidia GTX 1060 graphics. 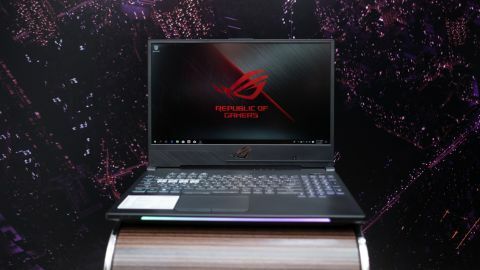 The Asus ROG Strix Hero II starts at a none-too-shabby $1,699 (about £1,270, AU$2,240), which is pretty decent when you consider it comes equipped with an Intel Core i7-8750H, GTX 1060 6GB, Full HD 144Hz display 16GB 2666Mhz RAM, 256GB PCIe SSD and a 1TB FireCuda SSHD. Those are practically the same specs you’ll find on the Acer Predator Helios 300, which costs a much more affordable $1,099 (about £820, AU$1,450), but also comes with a plain old Full HD 60Hz display. Of course, the recently announced Special Edition version of Acer’s affordable gaming laptop would be a fairer comparison, as it sports a newer Coffee Lake processor and an overclockable version of the Nvidia GTX 1060, but the company has yet to disclose pricing for the newest model. It’s strange to see a bezel-less display for a gaming laptop that costs as little as the Hero II does, yet nothing about it screams "budget". Rather, it’s a well-built notebook whose only fault is using a little too much plastic. This is especially noticeable just below the screen, where the bottom seems to be made out of a cheap strip of plastic that measures more than two inches tall. Asus has tried its best to mask this fact by giving almost every square inch of the Hero II an interesting texture or diagonally stacked brushed finish, and for the most part it works well. No two parts of this laptop look the same. The Hero II has also seen a serious injection of RGB lighting. The keyboard is now split into four sections that you can customize, along with a nearly full width light bar at the front of the laptop that can show a rippling spectrum of colors. Otherwise, the only really notable design element is the transparent keycaps on the Q, W, E and R keys to help multiplayer online battle arena players find their way to their hero skills. It might seem like a trivial thing, but the MoBA gamer focus of this machine is a big part of its draw. It's exactly while Asus split the ROG Strix Scar II off and tuned it for FPS shooter fans. The Asus ROG Strix Hero II comes with an 8th Gen Intel Core i5-8300H processor paired with at least a Nvidia GTX 1060 graphics card and 16GB of RAM. StarCraft II players and fans of other strategy games might want to opt for a CPU upgrade to the Intel Core i7-8750H to better power all those little AI units. Meanwhile, on the storage front you can have either a 128GB, 256GB or 512GB SSD paired with a 1TB hard drive or 1TB SSHD hybrid drive. Even with just a Core i5 processor, this machine looks poised to easily handle any MoBA game. Admittedly, these arena battle games are never too resource intensive, but it should have no problem running Overwatch, PUBG or even Battlefield V when it releases. Unfortunately, we weren't actually able to play any games during Computex, so we're hoping it performs as well as other equally-equipped notebooks in the wild. The Asus ROG Strix Hero II is a helluva an upgrade over what we expected from an affordable gaming laptop. On top the surprisingly attractive chassis, this laptop comes overly equipped to serve the MoBA community its targeting. However, its focus on diehard League of Legends and Dota 2 players may alienate other gamers.